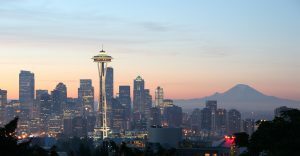 A coastal city with a population of around 650,000, Seattle is the largest city in both the state of Washington and the Pacific Northwest area of North America. The Greater Seattle metropolitan area is home to over 3 million residents and, in July 2013, was the fastest growing city in the United States. With a large and growing city such as Seattle, pest problems are inevitable. The following guide will take a look at some of the more typical pest complaints in the Seattle area, and provide information on how to address these. The Seattle is home to a ‘Mediterranean’ climate, with the city experiencing warm, dry summers and cool, wet winters. Although total precipitation is relatively low in volume, it is nonetheless frequent, with about 150 days of rainfall per year. Autumn, winter, and spring are typically the rainiest months. Extreme weather events are relatively unknown to Seattle, and the city is not particularly prone to thunderstorms. Seattle’s moderate climate means that its pest problems are typical of cities found in temperate weather systems, and does not have a significant bearing on pest issues. Nonetheless, it is a city that is vulnerable to a range of insect and animal control issues. So on the most significant pest issues in the Greater Seattle area are bed bugs, ants, and mice and rats. Bedbugs are a common problem throughout the US, and Seattle is no exception to this. They are very small wingless, oval-shaped bugs that feed on human blood. One of the reasons for this pest’s pervasiveness is the ease with which it can travel from host to host. Bed bugs are easily carried around in clothes and other possessions and can be picked up in hotels, dorms or guesthouses and brought into the home. Even just one pregnant female bedbug can lead to a nightmare infestation problem for Seattle homeowners. It can be possible to eradicate bed bugs from one’s home through DIY measures, which can include extremely thorough cleaning of house, clothes and bedding, and heat treatment of the affected area. Bed bugs, however, are extremely resilient, and difficult to starve out; they can survive without feeding for anywhere between 100 and 300 days. Due to this, bed bug infestation is best handled by a qualified pest control agent armed with the knowledge and equipment to thoroughly eradicate bed bugs from the home. The issue of who is responsible for pest control in a property rental agreement can be a complex one and varies from state to state. In Seattle, landlords are obligated by Washington state law to organize the control of pest infestations, except in the case of single family residences and where an infestation can be deemed to have been caused by a tenant. Pest control problems in such a situation are classified as a ‘repair’ responsibility and as such, the same guidelines for repairs should be followed by landlords as for pest removal. One of the leading pest control service providers in the Seattle area is Cascade Pest Control. Cascade Pest Control has been providing pest control services to the area since 1979, and can tackle a wide range of pest control issues, including those discussed above. The company also caters for a wide range of client needs, from smaller residential exterminations, to larger scale commercial projects. Other reputable pest control agents in the area include Dominion Pest Control Services Inc., All-Pro Pest Control and Paratex.